In this pic we are over 45 feet of water and have our down line baits set between 25 and 30 feet deep. You can see four baits being pulled through the water [ Horizontal lines] and a fish comes up from near the bottom and hits a bait. The fish initially pulls the bait down about 3 feet then we gain control and reel him up to the boat. This Striper does not appear to be very large on the screen but it was a solid 5 pound fish. 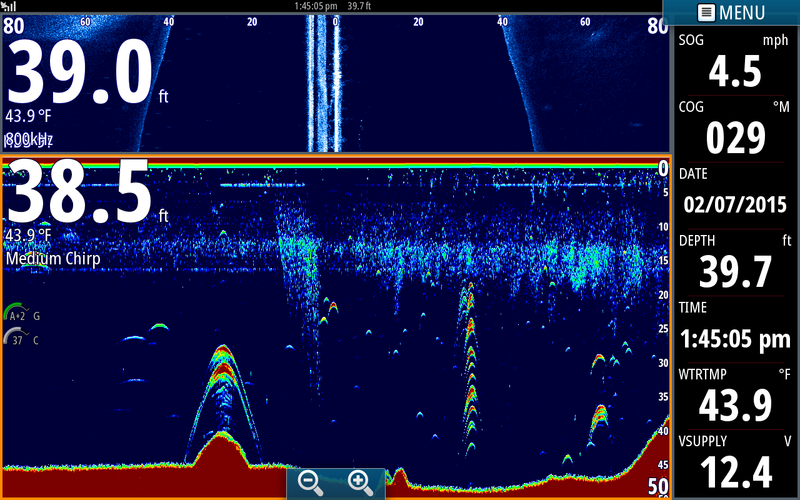 The fish was out to the edge of my transducer signal and showed up very week on the screen. 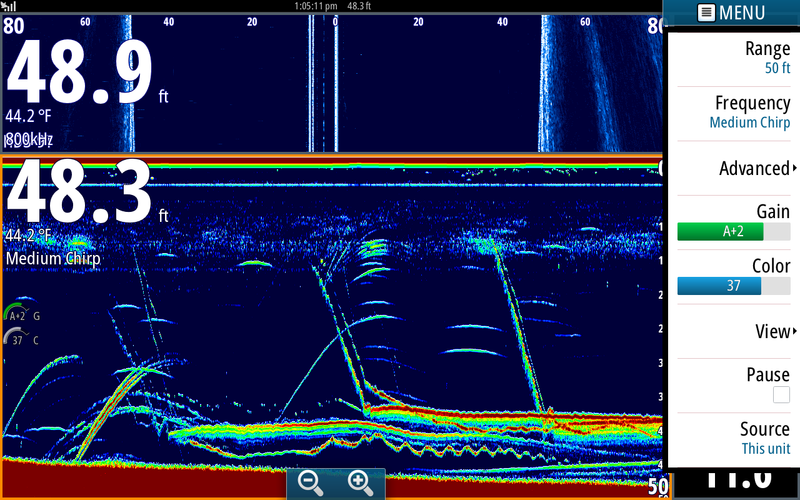 The closer the fish are to the middle of the ducer cone the stronger the signal appears on the screen. In this pic we had located Stripers between 40 and 50 feet deep so we deployed our baits to that depth. 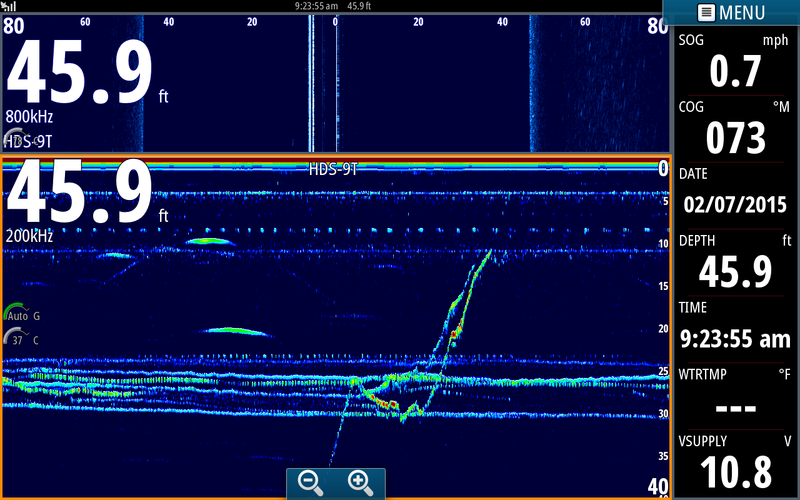 You can see four of our baits traveling from near the surface going down to 40 feet. For each bait we put out you can see to distinct images. The more solid signature is the lead sinker and the dotted lines is the baits swimming down. Once the baits are locked into place the sinker stays at a constant depth and you can see the bait swimming up and down on the screen. At the right side of the screen the four baits are in place and the sinker signature is stronger. This shot was typical of what we saw all day long. We would locate a few fish here and there, nothing ganged up. I am motoring at 4.5 mph looking for fish. Notice a hump on the bottom about a third of the way across the screen. A couple of nice Stripers are suspended above the hump. They may not look too big but I was moving fairly fast. If I was going the speed I fish at they would have showed up larger. About 2/3rds of the way across the screen is a stack of White Perch. They also are suspended. They stack vertically this time of year unless they are feeding, then they will streak. Just before I come up onto this ledge there are a couple more fish. None of these fish in this picture were feeding.